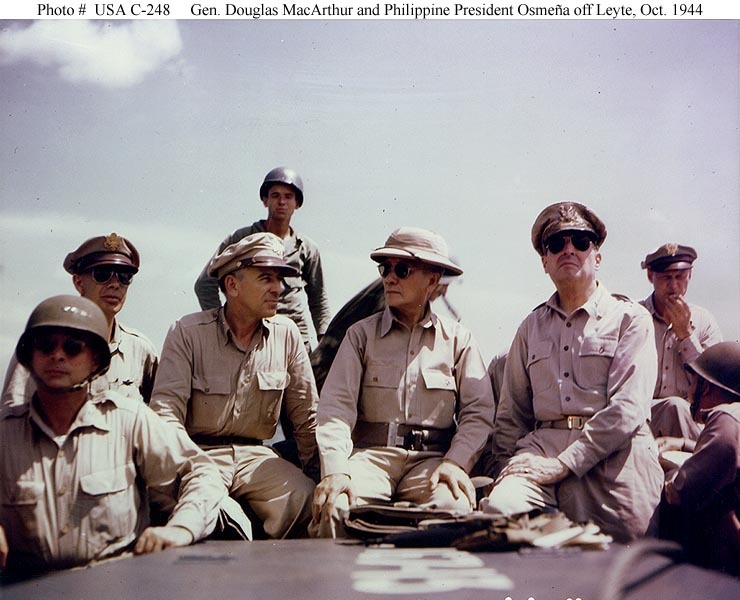 Philippine President Sergio Osmeña (center) and General Douglas MacArthur (right) on board a landing craft en route to the Leyte landing beaches, October 20, 1944. 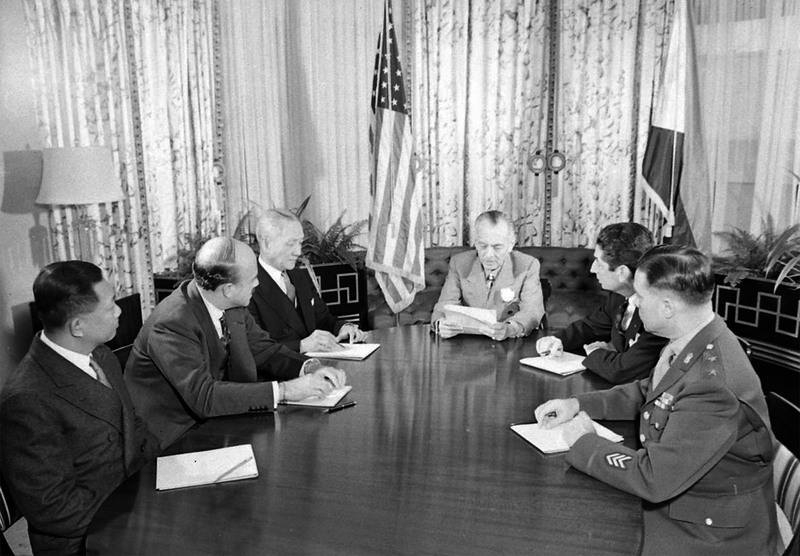 At left are Lieutenant General George C. Kenney and Lieutenant General Richard K. Sutherland. At the extreme right, with his head turned toward MacArthur, is Brigadier General Carlos Romulo. In the front row with two stars on his battle helmet, is Major General Basilio J. Valdes, Chief of Staff of the Philippine Army and Secretary of National Defense in the Osmeña War Cabinet. Photograph from the Army Signal Corps Collection in the U.S. National Archives. The Philippine Diary Project contains diary entries from a leading figure in the Leyte Landing: Major General Basilio J. Valdes. His diary, as encoded, edited, and provided to researchers by the Valdes family, provides an invaluable, first-person account of the entire Pacific War, from the outbreak of hostilities in 1941 to the restoration of the Commonwealth Government in Manila in 1945. During this period, Valdes, already Chief of Staff of the Philippine Army, became a member of the War Cabinet of President Quezon, accompanying him to Corregidor, and then to the Visayas, Mindanao, Australia and the United States. During that period he underwent further training in Fort Benning, Georgia. He then served in the Osmeña War Cabinet and in the first regular cabinet established by Osmeña in the Philippines, after which he returned to focusing on the Philippine Army until November 7, 1945. He established a private practice in medicine and served as the head of the Lourdes Hospital after the war. The Philippine Diary Project has already focused on the early part of World War II in the Philippines, contrasting the eyewitness accounts of officials like Valdes and civilians: see December 24-25, 1941 In Diaries for example. 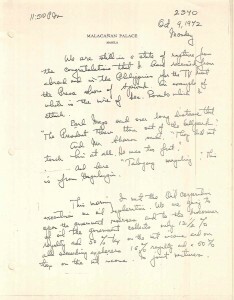 In Corregidor, the tensions of the time were also chronicled by Valdes; and it includes some acts of derring-do, for example the Evacuation of the Gold Reserves of the Commonwealth February 3, 1942. 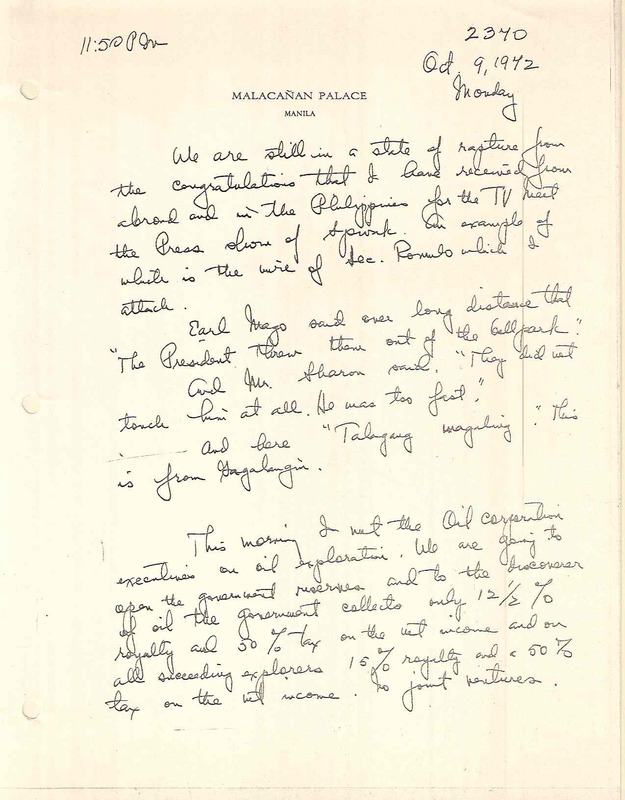 This was a time of particular crisis for Filipino leaders, which you can read about in The Debate on Taking the Philippines Out of the War: February 6-12, 1942. Valdes’ diary then chronicles the risky, tension-filled hegira of the War Cabinet from Corregidor to the Visayas, then to Mindanao and Australia. From there, the War Cabinet went to the United States to establish a government-in-exile in May, 1942. This entire period is a topsy-turvy one, and most accounts are confusing because the wartime situation necessarily made record-keeping and the keeping of an official chronology difficult. As for the Commonwealth government-in-exile, you will find Valdes mentioned from time to time in the diary of Francis Burton Harrison who served as an Adviser to the government-in-exile. Much of 1943 was spent by Valdes undergoing further training, with expectations growing that the Allied forces would soon be returning to the Philippines. The Quezon War Cabinet shortly after the Commonwealth government-in-exile was established in Washington, DC:Auditor-General Jaime Hernandez; Secretary of Finance, Agriculture, and Commerce Andres Soriano; Vice President Sergio Osmeña, Secretary of Public Instruction, Health, and Public Welfare; President Quezon; Member of the Cabinet without portfolio and Resident Commissioner Joaquin Elizalde; Secretary of National Defense, Public Works, Communication and Labor Maj. Gen. Basilio J. Valdes. Valdes seems to have been relatively uninvolved in the intense debate over the succession issue involving the Philippine presidency at this time. For an insight into this, read Frederick Marquardt’s Quezon and Osmeña. The Philippine Diary Project also allows us to contrast Valdes’ experience with those of civilians in Manila, before, during, and after the return of the Allies to the Philippines. Fr. Juan Labrador, OP, a Spanish Dominican priest, gives us the point of view of a Spaniard sympathetic to the Allies, and who shuttled back and forth between the Colegio de San Juan de Letran and the University of Santo Tomas where Allied civilians had been interned by the Japanese for the duration of the War. 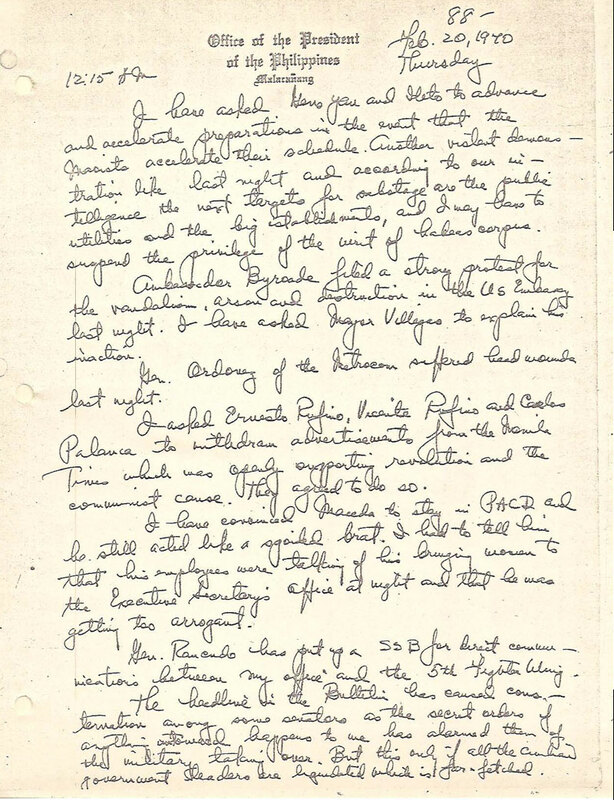 The diary entries of Felipe Buencamino III, a veteran of the Bataan campaign (see Bataan, 1942: Views of a Father and his Son), reflects the point of view of young Filipinos anxious for the return of the Allies and the expulsion of the Japanese. Here are extracts from relevant entries in the Philippine Diary Project, together with information from C. Peter Chen’s Philippines Campaign, Phase 1, the Leyte Campaign: 22 Oct 1944 – 21 Dec 1944 from which come the dates and summary of military movements, in italics. Diary entries from the same day or thereabouts follows each date. 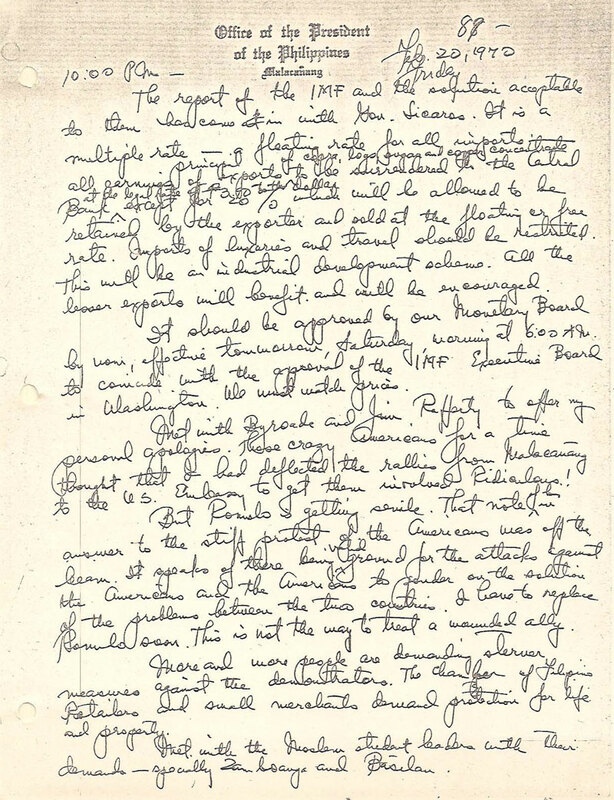 The diary entries of Felipe Buencamino III for October 1, 1944 and October 2, 1944 opens the scene, so to speak, with a description of how life in Manila was breaking down, and anticipation of an Allied invasion was building up. On October 3, 1944 Gen. Valdes tersely begins his journey home, flying from Washington D.C. to Hamilton Field, California. October 5, 1944: In preparation for the invasion of the Philippine Islands… United States Navy Admiral Chester Nimitz ordered Admiral William Halsey to strike Japanese airfields at Taiwan, China and Ryukyu Islands, Japan. On the same day, October 5, 1944, Gen. Valdes, President Osmeña, Col. Alejandro Melchor and Captain Antonio P. Madrigal had arrived in Hawaii and transferred to Kwajalein. By October 7, 1944 they had arrived in Hollandia, where Gen. Valdes shared a bungalow with Gen. Carlos P. Romulo. October 11, 1944: Halsey struck Luzon, and moved on to bombard Taiwan from 12 Oct thru 15 Oct. The attack on Taiwan disabled or destroyed every single one of the 230 fighters that Admiral Shigeru Fukudome had available to him at Taiwan. Other pre-invasion operations included bombing of Hong Kong, Dutch East Indies, and Mindanao. October 12, 1944: [A] cloudy day, a total of 90 Japanese aircraft were sent to attack Halsey’s carriers off Taiwan, which included Army B6N Tenzan torpedo bombers, Army Ki-49 Donryu horizontal bombers, and Navy P1Y Ginga horizontal bombers. A Japanese visited Tio Phil and told him that 700 U.S. ships were sighted north of Luzon including 100 aircraft carriers. I wonder if this is the invasion fleet, cross your fingers. October 13, 1944: 947 American aircraft struck several Japanese airfields at Taiwan. The Japanese staged a counter attack that achieved little, but inflated reports on damage inflicted on the enemy provided the Japanese leaders the false information that the counter strike sunk one aircraft carrier and one battleship; meanwhile, the Japanese admitted to only two aircraft lost. Seeadler Harbor in the Admiralties on 6 October 1944. 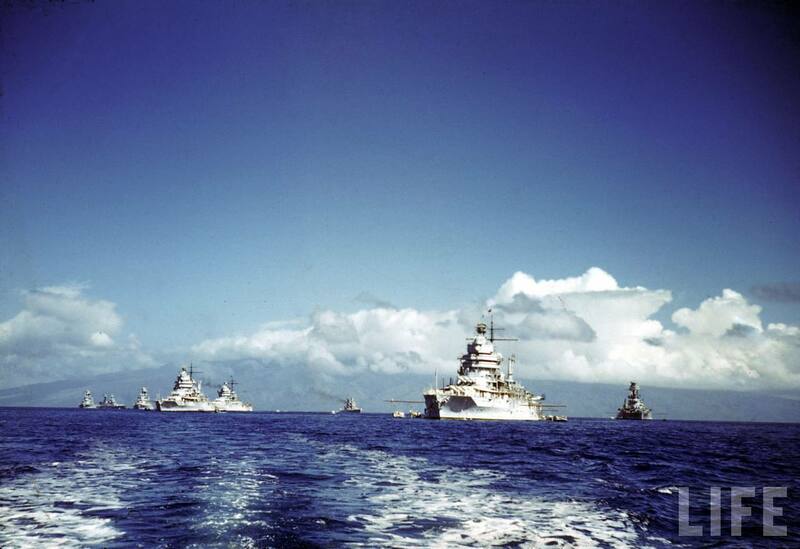 This is the invasion fleet for Leyte, Philippines. At 10:40 a.m. we boarded our ship the APH SS John Lang. Captain Graf the skipper, a very charming U.S Navy officer met us. Several cabins belonging to the officers of the ship were prepared for us. I occupy the cabin of Lieutenant John F. Moorehead the navigator, and I am very comfortable. 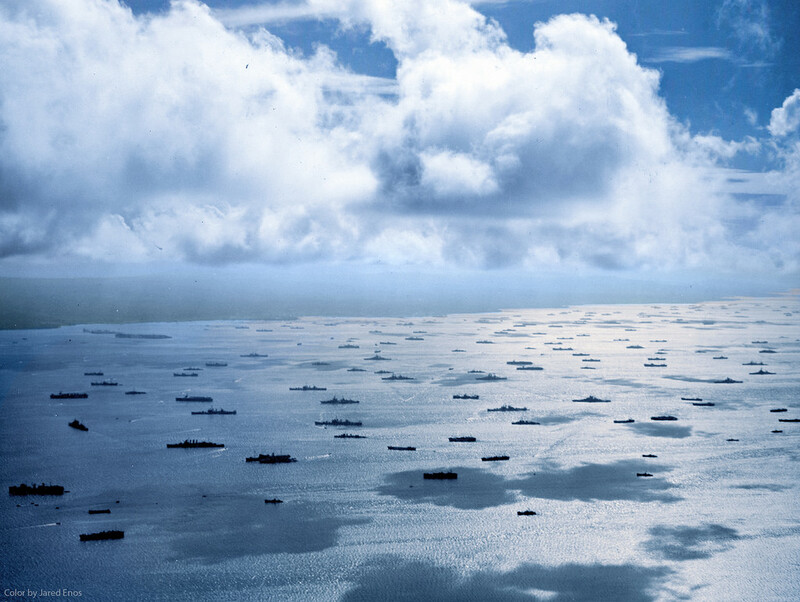 The bay is covered with ships of all kinds — hundreds of them: L.C.V’s, L.C.I’s, L.C.M’s, L.S.T’s, APA Cruisers, Destroyers, Airplane Carriers and P.T. Boats. Airplanes are flying over us continuously. What a magnificent display of force. This wonderful picture shows what the U.S can do when she gets started. The alert has been sounded for 1:30 p.m. In a few hours we will start moving, and then the biggest convoy set for an attack, since the invasion of France, will be on its way. I have talked to several officers and men. The morale is high, the enthusiasm inspiring. They are all happy to go, anxious to meet the foe in a death struggle. I am happy to be with them. At 2:30 p.m. life belts were distributed and instructions were given to us on how to use them in case of sinking. It is on the same principle as the Mae West life vest used by Aviators. It becomes inflated with carbon dioxide. We were advised to keep it on continuously and not to inflate until after we are in the water, as it would be dangerous to jump overboard with that inflated. It is warm; sea is calm, perhaps a presage of the “hell” to come. I hope the weather is good when we reach our objective. With the grace of God we cannot fail. The convoy started on its way at 4 p.m.. 400 ships of all kinds. We travel only at eight knots per hour because the L.C.I’s cannot go faster. October 14, 1944: American aircraft struck Taiwan and northern Luzon, Philippine Islands. About 240 Japanese aircraft were lost on this day both in the air and on the ground, including aircraft lost during another failed counter strike. Imperial General Headquarters reported that, once again based on inflated reports from the field, that at least three American carriers, one destroyer, and three unidentified warships were sunk, with another carrier and another warship damaged. The convoy is magnificent & impressive. It shows the tremendous power of the U.S. ships of all sizes, types and denominations. Today is the first anniversary of the Republic. Due to existing conditions—Formosa is under air attack—the celebrations were limited to some ceremonies at Malacañan. The projected parade before the legislative building was suspended. The suspension was attributed to the lack of transportation for the students and employees who were supposed to attend. Only the President’s family and some Japanese officials were invited to Malacañan. The public had never attended such ceremonies, nor is it interested in the welfare of the Republic, which they consider to be moribund and liable to collapse anytime, either violently or by natural death. Today’s the first anniversary of the Philippine Republic, heh, heh. Puppet Laurel declared: “The first-year of the Republic has been a success”. He forgot to say that during this republic’s first year, the people have had less and less food. The BIBA has distributed rice only three or four times. There has been no peace and order, no….. oh why crab about it. –adding that the public had been expecting an air-raid. October 15, 16, and 19, 1944: successive corrections to the reports further increased the number of American ships damaged and/or sunk during the counter strikes at the US 3rd Fleet operating east of Taiwan. At 11:45 a.m. another convoy coming from Manis Island joined us. We are now 600 ships. The hardest part is the total blackout at night. Hooray, there were here again… this morning. They came at about 10 o’clock, after Mass. Of course, you know who I mean by “they”. Japanese planes went up this time. People said there were many dogfights around Caloocan. Several civilians were killed. I saw a heartbreaking sight. An American aviator bailed out. First, he looked like a toy dangling on a white umbrella. Then his figure became more distinct and people started shouting “Parachute, parachute!”. When he was just above the housetops, Japanese soldiers started firing at him. I even heard the rat-a-tat of machine guns. Made my blood boil, this slaughtering of a fellow that’s defenceless. Can’t conceive how the Japanese can interpret such an act as bravery. Several of the boys that came to the house to play basketball believe this is the prelude to invasion. 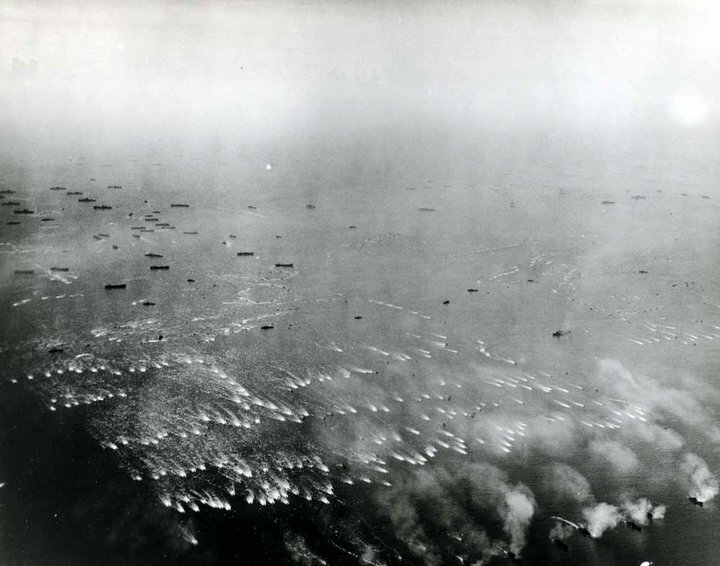 The Japanese have spread their ammunition dumps all over the city. In front of Hicky’s and Gabaldon’s and the street leading to the house and beyond there are a lot of boxes under the trees. Taft Avenue is exclusively for Army cars and trucks. Streetcars are also for Army and Navy men only. There’s a rumor that cars, dokars and bicycles will be commandeered. That’ll leave us with practically nothing. They’ve taken our food, our shelter and now –transportation. The Japanese claim they sunk 12 aircraft carriers. “We’ve driven them off,” they boast. “No,” added another, “we sunk them all.” That’s why I’m disappointed. I wanted them to come to make these fellows eat their words. Tio Phil thinks this was just a diversionary raid. Their main objective is Formosa, he said. They sent a couple of carriers here to mislead the Japs, he opined. America is still silent about yesterday’s raid. Some say Aparri was terribly bombed. That’s what I think. In my opinion, the air raid over Manila was just a feint. They were after some big game up north. I was reading this dogmatic editorial when the air raid signal no. 1 sounded, and within a few minutes, anti-aircraft shells were exploding above the clouds. The Japanese fighter planes, emboldened by the editorial, were flying confidently overhead when the American bombers came without having learned about the sinking of their aircraft carrier. Bombs exploded so loudly from Nichols that they could be heard in Balintawak, as a giant umbrella rose from the airfield. Eighteen out of sixty American planes were downed according to Japanese propaganda. Tokyo found the figure too low and increased it to thirty. Both agencies are giving a decisive importance, and as we supposed, a very inflated one at that, to the battle being waged at the east of Formosa. Tokyo radio arrived at fifty-three American ships sunk or damaged, twenty-thousand Americans killed, and one thousand planes shot down. The Manila news agency was more conservative, scattering flying leaflets in the streets and sending out a van through the city with streamers announcing the resounding victory. Several people were getting disappointed. They are asking: Maybe there is some truth in the Japanese claims of 12 aircraft carriers sunk? Is that why they can’t bomb anymore? Others are angry. They say: “The Americans shouldn’t have bombed at all if they were going to stop like this. It only gave the Japs a chance to spread their dumps into private houses. They should have kept it up, bombed on and on”. Only consoling note is the fact that Formosa is being bombed and rebombed. People say that this is a prelude to the invasion of the Philippines. “They’re neutralizing whatever help Formosa can give to the Japanese here when invasion comes” according to Joe. I don’t know what history books will write about this day. Maybe they’ll put it down as the beginning of the offensive for the reconquest of the Philippines. Or probably they’ll note it as just the 7th day of the naval attack on Taiwan with diversionary raids on the Philippines. To me it’s the day I had a narrow escape. A machine gun bullet struck our shelter, fortunately on the concrete side. If it had hit an inch higher, it would have penetrated the thin wooden panel and I wouldn’t be writing this now. I don’t know how many U.S. planes raided Manila today. They looked plenty and I didn’t have time to count because AA shrapnel started raining around our garden. By the drone and by the glimpse I had, I judged there were at least a hundred. October 18 to this tramp means nothing but several hours in the air-raid shelter, Mama nervous about Vic who refused to take cover, Neneng praying the rosary, grandpop smoking a cigar, Dad going in and out of the shelter to take a look and then to hurriedly run in when the earth begins to shake, and the dog trying to squeeze into the shelter. October 19, 1944: By the time the Imperial General Headquarters released the battle report on 19 Oct, it noted that 11 carriers, 2 battleships, and 7 cruisers and destroyers American ships were sunk. Furious but yet somewhat amused, William Halsey noted to Chester Nimitz that “[a]ll Third Fleet ships recently reported sunk by Radio Tokyo have been salvaged and are retiring at high speed toward the Japanese Fleet”, and Nimitz promptly made that message into a public relations piece. The top ranks of Japanese leadership bought into their own propaganda, with Emperor Showa personally delivered a word of congratulations for the achievement that never took place. We had a double feast today; great activity in the morning and doubly great in the afternoon. Without previous siren warnings the planes attacked at 7:15 a.m. and caught the sleeping guardians of the city by surprise. Before the anti-aircraft guns could be positioned, the enemies had dropped their loads and spun back to the skies beyond the reach of ground fire. There was not one red marked plane in sight the whole day. It’s either that they were not given the chance to take off or they were discarded for good. Anti-aircrafts barkings were fewer. Only the guns near the bombings were fired, unlike before when the air vibrated with activities and the city was draped in smoke. On the whole, the thunder was still terrific, but there were fewer shelling victims. It’s surprising how there could have been less accidents when people were all out in the streets watching and enjoying the fight in the sky. I found the internees the best indicators of oncoming raids. They were the first to identify American planes. All I did was watch these internees as they pointed to the skies and applauded noiselessly. 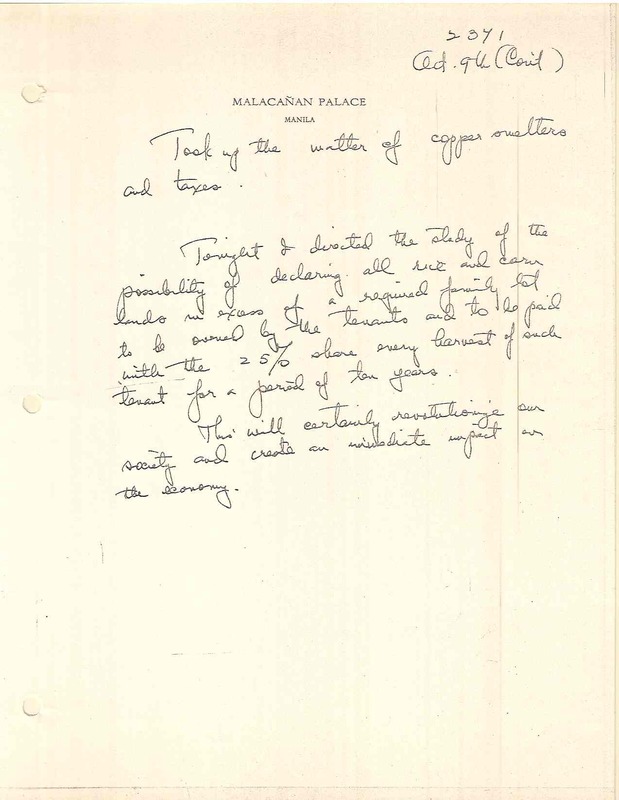 The contrast between the speculation in Manila and the stealthy advance –under cover of air-raids in other places– of the Allies is a striking one. 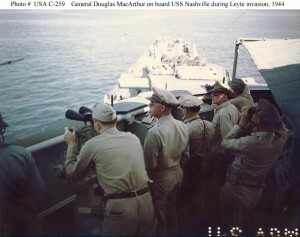 General Douglas MacArthur (right, seen in profile) on the bridge of USS Nashville (CL-43), off Leyte during the landings there in late October 1944. Standing in the center (also seen in profile) is Lieutenant General George C. Kenney. October 20, 1944: After a two-day naval bombardment, the US Sixth Army landed on the northeastern coast on the island of Leyte on 20 Oct 1944 under the command of General Walter Krueger. The US 7th Fleet under the command of Vice Admiral Thomas Kinkaid provided transport and protection for the 175,000-strong landing force. Against the advice of General Tomoyuki Yamashita, the Imperial General Headquarters in Tokyo (IGHQ) sent in reinforcements to Leyte from Luzon and as far as China, determining to fight the decisive land battle against the American land forces at Leyte. Landing troops almost whenever they wished, the US forces largely accomplished the goals set for the first day of landing. 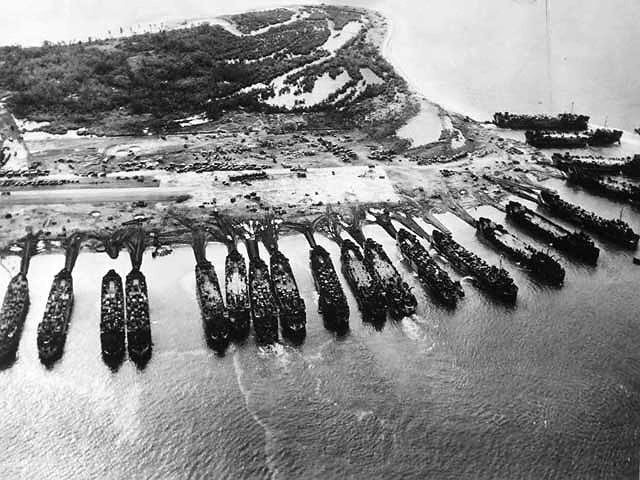 Part of Leyte invasion fleet with US Army troops assaulting Leyte beach. After having escaped from the Japanese and in the process fleeing his homeland, one can only image in the emotion felt by himself –and the other Filipinos in the landing party– when, on October 20, 1944, Gen. Valdes finally returned to the Philippines. Entered Leyte Gulf at midnight. Reached our anchorage at 7 a.m. The battleships, cruisers, and destroyers opened fire on the beaches and finished the work begun two days before ‘A Day’ by other U.S Navy units. The boys in my ship where ready at 9:45 a.m. At 10 a.m. sharp they went down the rope on the side of the ship. Their objective was Palo. At 1 p.m. General MacArthur and members of his staff, President Osmeña, myself, General Romulo, and Captain Madrigal left the ship and proceeded on an L.C.M for Red beach. The beach was not good, the landing craft could not make the dry beach and we had to wade through the water beyond our knees. We inspected the area, and at two instances shots were fired by Japanese snipers. General MacArthur and President Osmeña spoke in a broadcast to the U.S. We returned to the ship at 6 p.m. under a torrential rain. We transferred to the Auxiliary cruiser Blue Ridge flagship of Admiral Barbey, as the SS John Land was leaving for Hollandia. 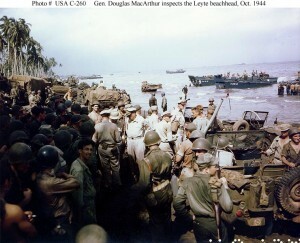 General Douglas MacArthur (center), accompanied by Lieutenant Generals George C. Kenney and Richard K. Sutherland and Major General Verne D. Mudge (Commanding General, First Cavalry Division), inspecting the beachhead on Leyte Island, 20 October 1944. Note the crowd of onlookers. The swamped LCVP in the right background is from USS Ormsby (APA-49). 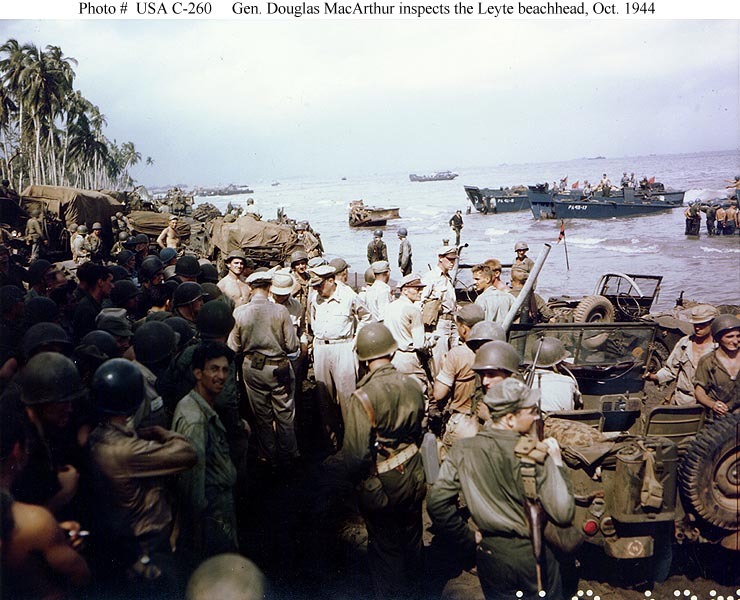 October 21, 1944: US 7th Cavalry Regiment reached Tacloban, the capital of Leyte. Civilians cheered them on as they entered the city, but the Japanese were still well dug-in. At 5:30 a.m. ‘general quarters’ were sounded. All rushed to their respective guns and fired at approaching Japanese planes. The Australian cruiser Australia was about 300 yards from our starboard side. A Japanese plane coming from the stern flew very low strafing the cruiser. He accidentally came too low and hit the wireless and crashed on the forward deck near the bridge killing the Captain and mortally wounding the Commodore, who died six hours later. The cruiser Honolulu was also hit and was beached to save it. The Australia returned to Australia for repairs. At 5 p.m. some more Japanese planes attacked us and we downed two. Joy! Joy! The Yanks have arrived. They landed on the same place where Magellan set foot on firm land when he discovered these islands which he called St. Lazarus. The news of the landing in Leyte spread like wildfire. We took the news as probable, without reassuring ourselves of its certainty, but the exultant Filipinos believed it without a shadow of doubt. Tokyo had admitted it, although the local press still refuses to put its stamp of approval. Gen. MacArthur and Pres. Osmeña were heard delivering messages over the radio. MacArthur announced that he had complied with his promise to return and, God willing, he would proceed with the re-conquest of the Islands. Osmeña declared that the legitimate government has been restored in this country. Reports have it that General Valdés, Soriano, Romulo and a nucleus of the exiled Philippine government has also arrived. No one—not even the sharpest strategists—predicted where the landing was to be made. Some guessed that it would be in Mindanao, or at some gulf in Luzon, or in some island in the Visayas, but not one of them singled out the place where the landing was actually made. After the fact, everybody admitted that the Bay of Leyte, formed by Leyte and Samar, was the least guarded, least defended and most strategic point for the developing operations. Situated almost in the center of the archipelago, it is one leap from Mindanao, from Luzon, and from almost all the islands of the Visayas. October 22, 1944: US 8th Cavalry Regiment secured the high ground around Tacloban, slowing strangling any remaining resistance in the area. At this stage, the American troops at Tacloban realized their mission became as much a humanitarian one as a combat one, for that many thousands of Tacloban residents were in dire need of food and shelter; some of the soldiers offered the little rations they had, while others opened up Japanese warehouses and distributed whatever they thought could help. The day was spent quietly as far as Gen. Valdes was concerned: his diary entry for October 22, 1944 recounts sending radio messages and dinner on board another ship with American officers. Tokyo radio, in announcing the landings in Leyte, added that the Filipino and Japanese defenses furiously counter-attacked the invaders. This reports, however, were not repeated in the Philippines for lack of any semblance of truth. What appear credible to us, however, are the rumors that the Constabulary strongholds are passing over to the invaders. We were told that the insular police of different towns, with their rifles and baggages, have taken to the mountains to join the guerillas. In Calamba, the Constables have gone into hiding in the mountain thickness, a pattern which we had observed at other times. The guerillas are becoming active, mobilizing ex-USAFFE officers and chaplains. With the first attack, whole towns have moved to the mountains. In some districts and provinces, the guerillas are in command. They cannot do so, however, in Manila, where it is risky for them to come out in the open. 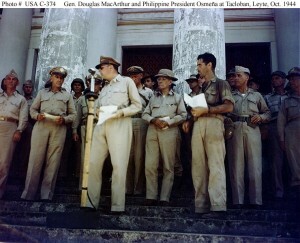 General Douglas MacArthur at the microphone during ceremonies marking the liberation of Leyte, at Tacloban, October 23, 1944. 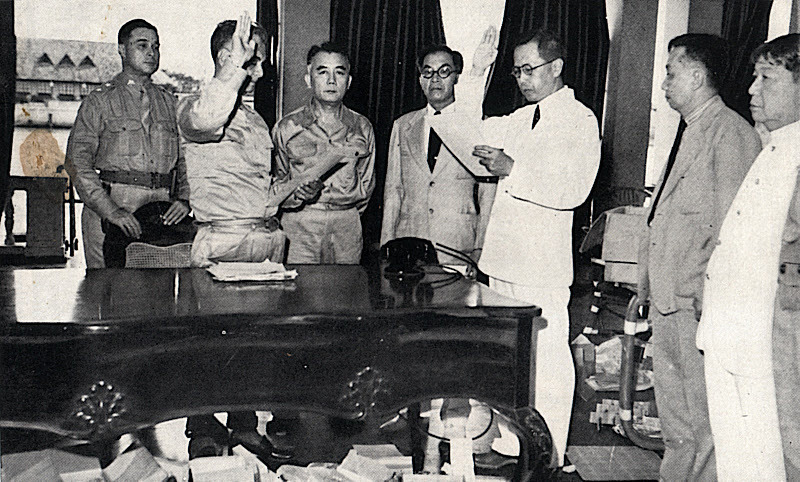 Philippine President Sergio Osmeña is in the center, one step behind MacArthur. 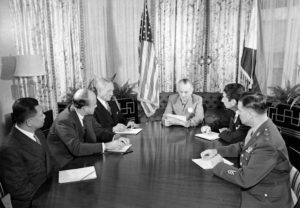 At left are Lieutenant Generals Walter Kreuger and Richard K. Sutherland. Disembarked and went ashore to Tacloban. 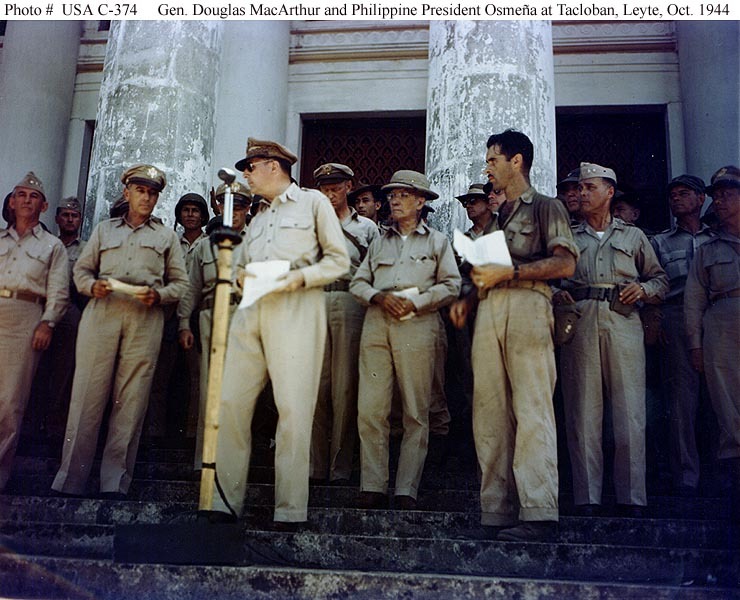 In front of the Capitol of the province, General MacArthur read the proclamation declaring null and void all laws promulgated by the Japanese and the puppet republic, and replacing those of the Commonwealth. His proclamation was followed by a speech by President Osmeña. At 2 p.m. I returned to the ship on a PT boat to get my luggage and return to Tacloban at 5 p.m. I was going to stay in the house occupied by the Japanese commanding general, which was made available for the President, but due to lack of space I accepted the invitation of Mrs. Losa to live in her home. Well, first there’s the landing in Leyte. The consensus was that they would land in Mindanao or perhaps Luzon so Leyte was quite a surprise. The Japs have admitted the landing but they’re trying to belittle it. Its been placed in a small corner of the front page. A lot of emphasis is being placed on the Taiwan affair. They’re tooting their horn about the aircraft carriers sunk, which to me is plain baloney. It seems they even had a sort of victory parade in Tokyo. People here think the Jap leaders are pulling the wool over the eyes of the Japs and that ought to be easy because they’re chinky-eyed. What really was a great surprise was the res-establishment of the Commonwealth Gov’t on Philippine soil. I’m not a very sentimental guy, but when I heard Osmeña and Romulo and Valdes and the rest were already in the Philippines, I wept like a kid. And when I repeated the story of how Mac landed to Dad, his eyes got moisty. The question now is when will they land in Luzon? Quite anxious to see Baby and Nini. Gee, I wish their old man pulled through. Sometimes I think he’s still alive. Yes, men like him, never die. He is the greatest man I’ve met. October 24, 1944: [T]roops of the US 8th Cavalry Regiment crossed the strait to the island of Samar. [At sea: Battle of Sibuyan Sea] See photo of President Osmeña, Maj. Gen. Basilio J. Valdes, Lt. Gen. Carlos P. Romulo in Leyte, 1944. 5:20 a.m. I woke up with the sound of two airplanes flying low over our house. I thought “It’s nice to have our planes patrolling”. A few seconds later I was startled by two explosions nearby. The concussion blew away my mosquito net. I jumped out of bed. I took a quick bath, as I was wet with perspiration, dressed and went to the place where the bombs had exploded. The first one fell over a nipa house killing the whole family who were asleep. A woman and six children. The husband was out working for the U.S. troops unloading. When he returned home he found his home destroyed and all his family killed. Poor man. The second bomb fell about 60 yards from the house occupied by the other members of the Presidential party. The President slept elsewhere. Some small shell fragments went through the house. Some twenty planes made a thunderous attack over Nichols, catching the guardians of the city unaware. They did not hit as accurately as on the first day. In San Pedro, Makati, bombs were dropped off-target. A boat in Manila Bay was bombed several times but it remained firmly afloat. A Japanese official attributed this poor hitting precision to the fact that the pilots were Canadians, not Americans. That was a consolation for the Imperial Air Force which had already lost supremacy of the air in the Philippines since the first day. A good part of the Japanese officialdom is gradually being convinced, not only of the possibility of losing the war, but also of the improbability of winning it. There are bombers flying. Nope, they’re pursuit planes, plenty of them, about fifty. They’re up too early, I think. Ben’s looking at them and he says they’re Japs. Yes, I think he is right. I can hear that familiar metallic roar… Vic is opening the radio to verify. Now, its not a raid. They’re playing a boogie number, “In the Mood” I think. Wait… I think that was an AA I just heard. Yes, siree, the guns are firing at something. It’s a raid, and the Japs have been surprised again. The radio is still playing “In the Mood”. Wow, I can see U.S. planes right here from the porch where I am typing. There goes five, ten, twenty, wow… so many…. heading for the Bay area. Now the house is shaking but they’re bombing the other side of Manila so I can still type. I want to give you a blow by blow description of this thing. Nope, change my mind. It’s getting too close. This blow-by-blow story might end up with this bum blowing up too. October 25, 1944: [A]ll initial goals had been met, with slightly lighter casualties than expected. [At sea: Battle of Surigao Strait]. The soldiers are commandeering horses, calesas, bicycles and push carts, and the people are forced to hide them. As a consequence, there is an even greater lack of transportation in Manila. This is a sign that the Japanese are running short of motorized vehicles. The trucks which they had confiscated at the start of the war are reduced to junk. They are now willing to pay ₱200,000.00 for an automobile of a reputable brand in running condition, and ₱400,000.00 for a good truck. The only cars moving about are those which are being used by the officers and ministers. There are many other cars, but their owners have dismantled them, hoping to drive them around again when the Leyte invaders arrive. At 9 a.m. left for Palo with Major Lambert 1st C.A.D., to inspect the post-office there. The town was full of soldiers, trucks, and tanks etc. The First Cavalry Division has a Squadron bivouac in Palo. The Church is being used as a hospital where army as well as civilian casualties are treated. Met Lew Ayers who is doing excellent work. Called on Bishop Manuel Mascariñas of Palo. He received me very cordially. He has accommodated civilian refugees in his convent and he himself at times sleeps in a chair. The Tribune says the Americans are shelling Lamon Bay. That’s about 60 miles from Manila in a straight line. Why don’t they hurry up because this waiting and waiting is killing me? Somebody told me the suspense is like waiting for the bride to appear in Church. Saw Emilio on my way home. He was looking at the map. I can hear the sound of blasting somewhere in the direction of McKinley. I’ m afraid the Japs are planting mines. Heard the G8s have been tipped to expect landings on either the 3rd or 4th. Listened to broadcasts from Leyte to America by the different newspapermen there. Liked Cliff Roberts’ “personal report”. Time had a good story on the naval battle off Leyte Bay. Courtney had a good report on the rehabilitation work in Leyte. Heard that Romulo gave a nationwide instruction to the Filipino people. It was short, dramatic: WORK OR FIGHT! Two air raids…An uncomfortable night. But there would be months more of fighting before the Allies even reached Manila –and then the death agony of the capital city would take place. See The Battle of Manila, Feb. 3-March 3, 1945 for eyewitness accounts of the Battle for Manila. During that period, on February 25, 1945, Valdes took on the Health portfolio; soon after that, he would leave the Cabinet altogether to wrap up his work as Chief of Staff of the Philippine Army. President Sergio Osmeña (September 9, 1878 – October 19, 1961) inducts his first regular Cabinet into office in the Council of State Room (now the Quirino Room) in the Executive Building (today known as Kalayaan Hall), Malacañan, 1945. 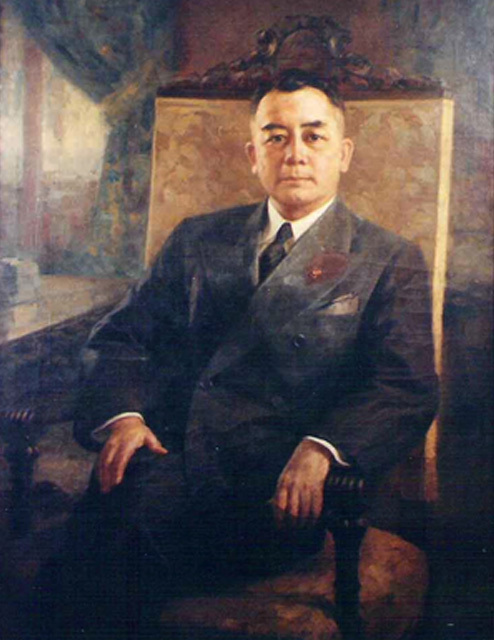 His first regular Cabinet was composed of Secretary of the Interior Tomas Confesor; Secretary of Finance and Reconstruction Jaime Hernandez; Secretary of Justice Ramon Quisumbing; Secretary of Agriculture and Commerce Vicente Singson Encarnacion; Secretary of National Defense Tomas Cabili; Secretary of Health and Public Welfare Basilio Valdes;Secretary of Public Instruction and Information Francisco Benitez; Secretary of Public Works and Communications Sotero Cabahug; Secretary of the Budget Ismael Mathay Sr.; Executive Secretary Jose S. Reyes; Secretary of Labor Marcelo Aduru; and Resident Commissioner Carlos P. Romulo. We are still in a state of rapture from the congratulations that O have received from abroad and in the Philippines for the TV Meet the Press show of Spivak. An example of which is the wire of Sec. Romulo which I attach. And here “Talagang magaling.” This is from Gagalangin. This morning I met the Oil corporation executives on oil exploration. We are going to open the government reserves and to the discoverer of oil the government collects only 12 1/2% royalty and 50% tax on the net income and on all succeeding explorers 15% royalty and a 50% tax on net oncome. No joint ventures. Took up the matter of copper smelters and taxes. Tonight I devoted the study of the possibility of declaring all rice and corn lands in excess of a required family lot to be owned by the tenants and to be paid with the 25% share every harvest of such tenant for a period of ten years. This will certainly revolutionize our society and create an immediate impact on the economy. Gen. Ver’s men have apprehended Lehman the American triggerman and Manny Crisoligo the explosives and electronics man. But they have not caught Eddie Figueras, Tony Arevalo, Osmeña, Larry Truckman and others involved. The duo have involved the other men and apparently there was an agreement that the Vice President would have to take over if I were assassinated so as to prevent anarchy. But we have to check the involvement of the CIA or the U.S. Embassy, Vice Pres. Lopez and other important personalities. Apparently they have been trying to assassinate me since Baguio (in Camp John Hay) in December 1971, the Rural Bankers Convention in the Pines Hotel, the SSS Convention of Labor in May 1st. The Comby car that was prepared for the plot is indeed alarming. I have dismissed some judges and punished some fiscals. 1. The clean-up in Isabela, the Cagayan Valley and Mt. Province. 2. The policy in Mindanao and Sulu -we delay action there until we can concentrate our troops. 4. To prepare for the regrouping of the armed gangs, criminal or not, and the Communists. 6. Reward for the Armed Forces. Met Justices Fred Ruiz Castro and Salvador Esguerra on a consulta. I told them frankly that I needed their help and counsel because we must keep all the actuations within constitutional limits. Justice Castro asked permission to ask a blunt question, “Is this a coup d’etat?” and I told him that it is not but it is the exercise of an extraordinary power by the president for a situation anticipated by the constitution. Justice Esguerra said immediately that he feels that it is a legitimate exercise of martial law. And apparently reading my mind, he said, in the Merriman case, Justice Tannay had issued a writ of habeas corpus for a man who was detained on orders of President Lincoln. And President Lincoln just disregarded the judicial order. And Justice Tanney said, “what can we do, we are confronted by a superior authority? I then concluded that there must be no conflict between the two separate departments of Justice and Executive for it would be embarrassing to both. I believe that they are both of this persuasion. The public reaction throughout the Philippines is a welcome to martial law because of the smooth, peaceful reestablishment of peace and order and the hope of a reformed society. In fact most everyone now says, this should have been done earlier. I attach the report of Boni Isip about the same result of a survey conducted by Liberal Party Leader Gerry Roxas. It is indeed gratifying that everyone now finds or discovers I am some kind of a hero! There is nothing as successful as success! Diokno, Chino Roces, Max Soliven etc. have filed a petition for a writ of habeas corpus before the Supreme Court. I asked Justices Claudo Teehangkee, Antonio Barredo, Felix Macasiar and Felix Antonio to see us. They insisted that the government should submit to the Supreme Court for the Court to review the constitutionality of the proclamation of martial law, Proclamation No. 1081. So I told them in the presence of Secs. Ponce Enrile and Vicente Abad Santos as well as Sol. Gen. Estelito Mendoza that if necessary I would formally declare the establishment of a revolutionary government so that I can formally disregard the actions of the Supreme Court. They insisted that we retain a color of constitutionality for everything that we do. But I feel that they are still image-building and do not understand that a new day has dawned. While they claim to be for a reformed society, they are not too motivated but are too bound by technical legalism. I met the cabinet to emphasize the program to reform our society. And I signed the decree (No. 1) to promulgate the law on the Reorganization of the Government. Tomorrow I will sign the decrees promulgating the new Civil Service Rules, the Rehabilitation and Reconstruction Law, the Land Reform Funding and dismiss some judges, the CIR judges, Public Service Commission. We have impressed everybody with our fairness by the arrest of Cong. Roque Ablan, Rafael Aquino and Gov. Luis Bocalan. I have ordered profiteers to be arrested. And the ROTC boys have cleaned up the streets of graffiti. Only KBS and the The Daily Express are operational. I just talked to Earl Mayo, the biographer and advisor of Nixon, and his first advice is to immediately meet the press as soon as possible and explain that this is not a dictatorship. Sec. C.P. Romulo, whom I talked to again by long distance, has done a good job of holding press interviews and issuing press releases. The Daily Mirror (most of the wise coffee-shop habitues call it the Daily Error) headlines that Sen. Lagumbay is being punished by me for refusing to sponsor tax measures – which is completely false as the truth is this is a Senate matter triggered by the newspapers and taken over by the Perez committee. I could not in conscience do anything but authorize the BIR to reveal his name. Now Aytona is caught in a bind for conflict of interest. The PNB Union and PAGE (Phil. Association of Government Employees) are also threatening a strike or demonstration. They could not come at 6:30 PM and so I meet them at 12:00 noon tomorrow. Played golf early in the tournament at Bonifacio to raise funds for the watering system. Came back to the Palace in a hurry to catch the Ilocos Norte mayors and delegation being briefed by Imelda on their program for me on Monday, the eve of my birthday celebration. Retreated when Imelda shooed me away. Inaugurated at 5:00 PM the CAA-PAF management operation and information center. Gave a plaque of appreciation to Gen. McNickle of the 13th Air Force USAF for the help like the radar we are using at MIA now, electric generators after the earthquake, etc. Have just arrived from Sec. Romulo’s house at Forbes Park where the cabinet tendered me a dinner for my birthday celebration on the 1st of September. He had been able to collect an impressive collection of cablegrams from heads of state and heads of government. Although this message-sending is a yearly occurrence. Dinner was up to 10:00 PM – then a reception and dance up to 12:15 AM. This is a tradition I hope will be followed throughout the years as a President must depend for success upon his cabinet. We also had the first picture taken of the cabinet with me (only the Vice-President was absent). I am getting all the cabinet men to work. As I said in my response to Sec. Romulo, there is one basic difference between the cabinet of Pres. Quezon and my cabinet and that is that Quezon’s cabinet was composed mostly of political kingpins while my cabinet is composed of technocrats mostly without political backing. I also announced the policy of more autonomy for bureau directors and department heads as well as the objective of establishing a civil service that can operate efficiently without the intervention except on basic policy of an elective legislature or even the President or department head. I have asked Gens Yan and Ileto to advance and accelerate preparations in the event that the Maoists accelerate their schedule. Another violent demonstration like last night and according to our intelligence the next targets for sabotage are the public utilities and the big establishments, and I may have to suspend the privilege of the writ of habeas corpus. Ambassador Byroade filed a strong protest for the vandalism, arson and destruction in the U.S. Embassy last night. I have asked Mayor Villegas to explain his inaction. Gen. Ordoñez of the Metrocom suffered head wounds last night. I asked Ernesto Rufino, Vicente Rufino and Carlos Palanca to withdraw advertisements from the Manila Times which was openly supporting revolution and the communist cause. They agreed to do so. I have convinced Maceda to stay in PACD and he still acted like a spoiled brat. I had to tell him that his employees were talking of his bringing women to the Executive Secretary’s office at night and that he was getting too arrogant. Gen. Rancudo has put up a SSB for direct communications between my office and the 5th Fighter Wing. The headline in the Bulletin has caused consternation among some senators as the secret orders if anything untoward happens to me has alarmed them of the military taking over. But this only if all the civilian government leaders are liquidated which is far-fetched. The report of the IMF and the solution acceptable to them has come in with Gov. Licaros. It is a multiple rate – a floating rate for all imports; all earnings of principal exports of copra, logs, sugar and copper concentrate to be surrendered to the Central Bank at the legal rate of ₱3.90 to the dollar except for 20% which will be allowed to be retained by the exporter and sold at the floating or free rate. Imports of luxuries and travel should be restricted. This will be an industrial development scheme. All the lesser exports will benefit and will be encouraged. It should be approved by our Monetary Board by now, effective tomorrow, Saturday, morning at 6:00 AM to coincide with the approval of the IMF Executive Board in Washington. We must watch prices. Met with Byroade and Jim Rafferty to offer my personal apologies. Those crazy Americans for a time thought that I had deflected the rallies from Malacañang to the U.S. Embassy to get them involved. Ridiculous! But Romulo is getting senile. That note of his in answer to the stiff protest of the Americans was off the beam. It speaks of there being valid ground for the attacks against the Americans and the Americans to ponder on the solution of the problems between the two countries. I have to replace Romulo soon. This is not the way to treat a wounded ally. More and more people are demanding sterner measures against the demonstrators. The Chamber of Filipino Retailers and small merchants demand protection for life and property. Met with the Moslem student leaders with their demands – specially Zamboanga and Basilan. Manila Times and even the Bulletin are trying to promote a fight between me and the Media. Manila Times headlined the Nolan resignation, actually editorializing in that story. Then, yesterday, the Bulletin carried the front page story of me keeping on with attacks on the press quoting my statement or speech read by VP Lopez in the Bureau of Plant Industry inauguration that “notwithstanding the critics, we have moved forward”. This was interpreted, I suppose, to mean that the press are critics or the only critics and should not be referred to with the slightest hint of derision. My relations with the press in general, with the exception of the Malacañang boys has soured since the inaugural speech. They can dish it out but cannot take it. My erstwhile opponent, Sen. Sergio Osmeña, has gone to see Pres. Soeharto of Indonesia, and as reported by Ambassador Farolan, is determined to get the dormant concession of Brigido Valencia at Sumatra or East Kalimantan belonging to Americans. Accompanied by a representative of Nissio-Nurai, apparently the financier, this party surveyed the Sumatra concession of Valencia and apparently a favorable report submitted. and take-over plans will come from Osmeña. Osmeña is also in touch with the groups that are preparing a revolution in Sabah and has been instrumental in the offer by Malaysia or Sabahan authorities in offering to Princess Tarhata and Sultan Ismail Kiram to buy out their claim to Sabah. They may sell only their private rights. But I have ordered Sec. Romulo to write a formal letter to Sultan Ismail Kiram that he has authorized the Philippine government to bargain for him and that he must not embarrass our government; and for Amb. Busuego to informally notify the Malaysian authorities that Sultan Kiram cannot bind the Philippine government. Deputy Premier Tun Abdul Razak of Malaysia has announced a record U.S.$ 267.7 million budget for defense and internal security or 25% of the total expenditure of U.S.$ 1,080,130,000 for FY 1970. Defense budget for FY 1969 is U.S.$ 132M or 9.2% of the total 1969 budget. Razak justified the increase with the British military withdrawal and the stepped-up communist terrorist activities. In Pakistan 56 million registered to vote out of 125 million in Pakistan’s first general elections scheduled 4 Oct 1970. Ex-Pres. Macapagal who is visiting in Singapore says that he is shocked by the news that there is supposed to be a secret agreement for the Sabah claim to be relinquished by the Philippines after the resumption of diplomatic relations. There is no such agreement. I used Mr. Moon Park and Mr. Chang Ming Thieu as emissaries to Prime Minister Tungku Abdul Rahman and Deputy Prime Minister Tun Abdul Ragak so that they would agree to the resumption of diplomatic relations. 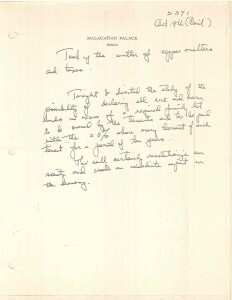 The Tungku had insisted on such relinquishment of the claim and a recognition formally of the sovereignty of Malaysia over Sabah, but I refused and they formally agreed that after diplomatic relations our two peoples should get used to each other travelling in our respective countries before we spoke of these matters. The Filipinos should now go to Sabah and invest there. VP Agnew in Thailand and Taipeh has said that I asked him whether America was slowly withdrawing from Asia and he had answered in the negative. I asked Pres. Nixon the same thing. He was more vague, although when he reached the U.S. he did say what Agnew is saying now. that, of course, the number and location would change with the need. He told me nothing of the kind. On the last day of his stay here, Jan. 1st, when I talked to him about the U.S. helping us on our present balance of payments problem, he was evasive. I did not press the point. Either he has no power to commit the U.S. or he is still feeling his way around. During the conference at 11:30 AM if Dec. 31st when I met all the special envoys of 44 governments who attended my inauguration, the only matter on which there was some vestige of promise of help was on studies of typhoons and their control. Amb. Byroade is supposed to follow this up. I impressed on VP Agnew that we in Asia could not make any plans on our security if we did not know their plans but that however even in such state of ignorance we in the Philippines are moving to prepare to defend ourselves on our own. He invited me to come to the U.S. after September 1970 – preferably not while the other heads of state are in the U.S. on the UN anniversary. I made no commitment on the exact date but did promise to go. Pres. Nixon and VP Agnew strike me as very evasive about helping the Philippines now although they are supporting us in the IMF and IBRD in our efforts to get dollar loans. I am skeptical about the wisdom of a trip to the U.S. I have told Sec. Romulo repeatedly that there should be no further talks of the U.S. military bases in the Phil and our wish to remove them as we will use this as the “ultimate weapon” in the trading that may be needed to obtain recognition of our special preferences in the American market. For if our quota on sugar is not extended by the Sugar Act’s extension this year or by treaty in the replacement of the Laurel-Langley agreement, then the sugar industry is wrecked and our economy may be disastrously affected. So I have told VP Agnew that before the formal negotiations on trade and security start we should have an understanding as to what terms such negotiations would arrive at. I said that I would like Amb. Byroade to be able to sit down with me on this. Rod Reyes, editor of the Manila Chronicle, has just told Kits Tatad that they are planning to serialize the libelous book of Chit Navarro on Imelda. We have to watch the Lopezes and Montelibano. They are still sore for my veto of their franchise to operate a telephone and telecommunications company anywhere in the Philippines and the NuVue – a cable television company that would select programs from any of the television companies (without permission from the latter) to be flashed to their subscribers by cable. Both were illegal and unconstitutional but they took offense at the veto. They are the worst oligarchs in the country. I must stop them from using the government for their own purposes. Piding Montelibano is working on the reclamation project of Republic Real Estate – pending adjudication in the courts. Iñing Lopez strongly urged that I appoint Piding as Secretary of Finance, as if the position were vacant. This was a repetition of the recommendation in 1965. Peace and order must be immediately attended to. I must work out the programs for exports and tourism. Then I must appoint the replacement of Gov. Calalang as Governor of the Central Bank. The IMF consultative group arrives in Jan. 10th. There are more than 100 CFI vacancies, 7 Court of Appeals, one in the Supreme Court and another vacancy coming up in February. The Armed Forces has too many hold-overs who should be retired. We must change the strategy in Central Luzon against the Huks. We must restudy the use of civilians either as agents or informers. Exports and Tourism come under the 2nd and Central Luzon under the 1st. Could not sleep right away after retiring for the night last night——had been laundering a pair of socks which I plan to use tomorrow when we leave as it matches my Palm Beach suit. It has two little holes, however, but will ask Rosie to mend them today in a hurry. The night was rather cool, so much so that towards morning had to cover myself with a woolen blanket. Got up around 5:30 for my usual operation, went back to bed again, but in a few minutes decided to get up after doing my bending-up exercise on the cot the usual 25 times and started right away to sweep and mop the room in readiness for the heavy packing facing me during the day. Finished these chores sufﬁciently early to finally bring down my bags from on top of the toilet-—They are both very dusty and have just let them lay on the floor for a little while until after breakfast and just before bath which Would be most suitable time to clean them. Gave Aquino “Time” of July 8th to read yesterday am. Returned Paper to me in the afternoon. Have not started to read yet myself——think will do it on the plane homeward bound to kill time. Last bath this morning in Sugamo. Started removing contents of trunk (#32) right after and was on this task when was called for barber. Also last haircut in Sugamo——gave barber the usual 2 pkgs and one to the other. Told him was returning to Philippines in the morning-—gave me his card. Did pretty thorough job including cleaning of nose and ears. Barber bowed deeply as I got out and shake hands with him. Went out to morning exercise in Khaki suit expectinf Capt. Gross to call as he promised last Saturday but was called out by front office people instead. They had my letter of yesterday re my things in the ofﬁce. They had identified and found most ‘of those listed except the boy scout knife and the little pencil knife that goes with Faustino’s necessaire set. Nail clipper was also missing but they found a nail file which I had forgotten to mention. They also ‘said there were three big bottles that were not in my list—told _them I purposely left them out——whisky, and yumeisu——did not care for them anymore someone could use them if desired. Tincture of Iodine bottle was also gone. Told them never mind, was satisfied to recover those they had found. Forgot to mention razor, but Pete, who was present, said he would send along the one I have been using here all this time. Things seems to be most satisfactory, for even the two Art catalogues that had been autographed they were returning presumably. While out on morning exercise Pete came to tell us to get ready to leave by six o’clock tomorrow morning! By Jove, that means we may get home for my 27th wedding anniversary, if everything goes according to schedule—We are due in Manila by evening, and if we can be immediately released we may have a wedding anniversary dinner yet in Kawilihan tomorrow night. Hurray! What excitement and feverish preparations they must be having there now! While writing this (11:40 am) Pete came in to say we should have everything packed by this evening. Our baggage and stuff will all be waiting for us in the ofﬁce in the morning and we should first separate what we will bring along on the plane, the rest will be taken care of by them for later shipment——they will be moved out of here anyway. He glanced at the clothes on my cot and spotted the three bed sheets, said he had been looking for that stuff all over but could not ﬁnd any. Offered to give him one—it’s the large size stuff 90 x 108 ——told him to take it as a souvenir from me. Accepted it reluctantly said he would send it back home to his wife. Told him I would have to leave the stuff here anyhow in the trunk, as I will not be able to carry them all on the plane. Also asked him whether I could take with the (sic) me the GI towel as a souvenir, said it would be alright I guess. I (illegible) anyhow when we leave here we will still be technically in the custody of the Army. the room, so the colonel (illegible) went away mumbling something to the Capt. which the latter did not even bother listening to. The Capt. told me as soon as Hardy was gone —— “You hold this under your hat, but whatever you are bringing tomorrow will not be inspected much—but you had better hold it down to not more than 65 to 70 lbs. We are leaving by private plane at six in the morning. I shall Pick you up from here at about 5:45 We will leave from Atsugi around 7 to 7:30, will go direct to Manila and will be at Nielson field about 5:30 or six in the afternoon. “Without refuelling Capt?” I asked. “Without refuelling,” he affirmed Gen. MacArthur has already sent a private message about our departure, and I am sure Pres. Roxas will notify your family and they will be there to greet you when we arrive. There will be no publicity about the trip, not from here although there will be a release by the Army after you have been delivered to Pres. Roxas. That’s why I want to know certain things from you! Then he noted down my full name the positions I held during the Japanese occupation which I ‘gave as Mayor——Jan 5-23, ’42, Chairman, Jan. 23 ’42—Oct. 14, ’43 and Ambassador, Oct. 26, ’43——Aug.7, ’44. He asked when I name to Japan, date of presentation of my credentials to Emperor. When I gave it as Feb. 29th, was 1944 a leap year? He was surprised—— told it being it was and I purposely picked up that date so that there would be no anniversary of it. He smiled. As ﬁnal question he asked whether I had ever held an elective post told him no, purely administrative and executive! Then We spoke on collaboration cases, He likened matter to case he says he has been working on for sometime now, mostly on his own time. Said he will go back to Manila to prosecute that case himself and will stay there for about 3 mos. This time he is only staying around 10 days with Col. Carpenter who he said was also coming with us tomorrow. I invited them both to dinner at Kawilihan if and when convenient. Said he will be glad to go but will wait until we got to Manila to decide. Said case he referred to was that of those responsible for killing of Jose Abad Santos. When I told him I had seen a report Kawakami had committed suicide, he said yes, I arrested Kawakami myself, turned him over to the Japanese police and told them to have this man come to my ofﬁce at ten o’clock the next morning. That evening they came to tell me so sorry, Kawakami killed himself. But that would make no difference in the case, I am after bigger game. And Santos’ case has a direct bearing on your own. He was asked by the Japanese to cooperate and when he refused or stalled for time he was executed. They would have done the same with you. If you had not surrendered to their service, you rendered only lip service at any rate, you would not be alive today, iust like Abad Santos. Perhaps if, I had been in your place under the same circumstances I would have done the same things you did. Asked me afterwards to have my trunk ready for shipment if not tomorrow at some subsequent time. Went back to room to finish packing and then out for afternoon exercise. Then I asked Aquino if he had any space in his bag for my bath robe which I had forgotten to put in the trunk and the darn thing is already too full for anything. When we came back he came over to get the bathrobe and also the wire for tying up his suit case. While writing this Steinmetz came in to give me 5 pieces of Hikais cigarettes. From now on he said we will get only 5 Jap cigarettes a day. Told him, thank goodness we don’t have to take them—we are already going home! 5:45 pm. Will not write any more from now on—no more time. It’s Home! Home! Home!